The domestic football season in Europe is now over…normally we would be really depressed about that right? Great thing we have the World Cup just around the corner! And a World Cup means new boots, and all the major boot companies have finally shown their hands for the World Cup. 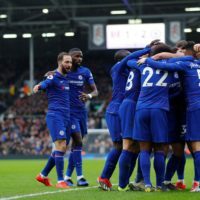 But there is more to the boot world than the boots themselves, and of course I am talking about our favourite boot spottings! 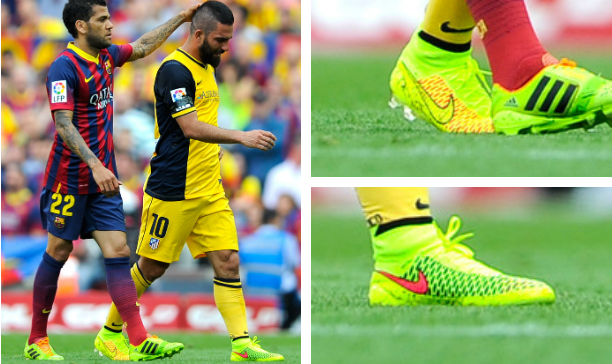 There were a number of surprising boot spots this week, and the Nike Magista got it’s first on-pitch debut this weekend as well. 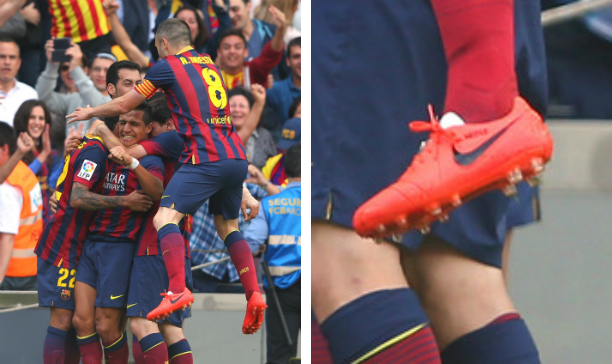 Check out who wore what with the Instep! Which is what we would be saying if Arda Turan did not pick up the slack for Iniesta, the Atletico Madrid midfielder ensured the Magista was represented in a game that created what will be seen as an iconic moment in Spanish football. We have been waiting such a long time to get our hands on the Magista (hard to believe that it has taken Nike a whole 2 and a half months from unveiling the boot to actually releasing it for sale), but we are almost there people, it goes on sale on Thursday! 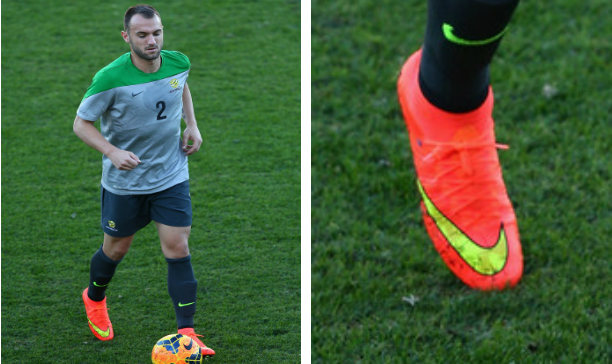 Of course, the World Cup boots are not just about Nike. 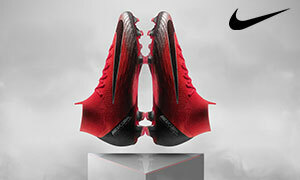 Puma released what is probably a decent shout for the most recognizable boots for the World Cup with their new Tricks series of boots. 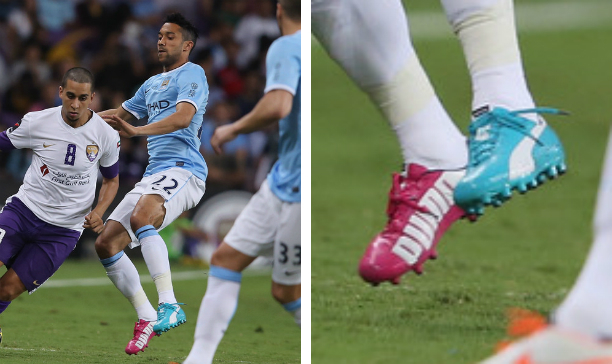 With a pink right boot and a blue left boot, we cannot believe it has taken the boot companies so long to play on the trend that was started by Benoit Assou-Ekotto nearly 3 years ago! 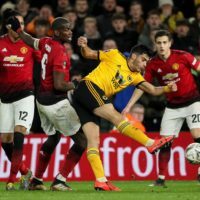 The Tricks series of boots saw much of the limelight in the FA Cup final, with a number of Arsenal players bringing the boot out for the first time, but it was Gael Clichy who was the first to wear the boots in Manchester City’s friendly against Al Ali. Well…this one is a touch surprising hey? 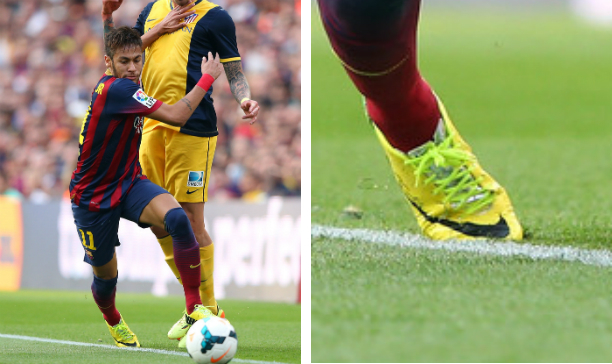 Arguably the eyebrow raising boot spot of the weekend, headline Hypervenom Phantom athlete Neymar strangely put away his Hypervenoms on the weekend in favour for the Nike Mercurial Vapor IX, a boot he has not been seen in since his playing days back at Santos. We are thinking that this is only a temporary switch for Neymar, we doubt Nike would let their Brazilian headliner not wear the boot he has been showing off for the best part of a year. Either way, it is a notable switch from the forward. No, even though it is (partially) black and white, Lukas Podolski is not wearing the Battle Pack F50 adiZero before it is meant to be on the pitch. Instead, Podolski has opted for a very special pair of F50s for what was Arsenal’s biggest game in recent years, with his boots being a tribute to ill F1 superstar Michael Schumacher. With the three stripes decked out in the colours of the German flag and a message of ‘Keep Fighting Michael’ printed on a camouflage backdrop on the upper. Lovely show of support from Podolski in a game viewed by millions around the world. So everyone else is getting the various World Cup boots? Well, it seems Fabinho does not really care, the Philadelphia Union defender has gone for the always unique miadidas road. Fabinho has customised his adiPure 11Pros in a funky White/Slime colourway, which gives a modern pop to a boot that still has a heritage feel about it. Anyone else feel this boot reminds them of the White/Chrome/Black adiPure 11Pro SL with the slime Sprintframe? Yeah, me too.